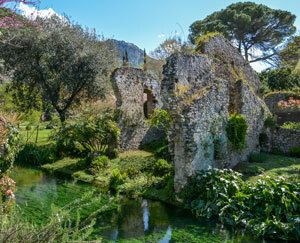 The Garden of Ninfa features one of the most beautiful botanical gardens in Italy and the Natural Park of Pantanello. The scenery for the visitor consists of a crumbling medieval town, composed by ruins of a castle, buildings, churches and belfries. All surrounded by a nature with lush colors: a thousand-shades-of-green rich nature, the river Ninfa and the its lake that reflect the color of the sky and the several bloomings of spring, summer and fall. If you’re in Rome, we recommend you not to miss this out of town trip. Especially in springtime, when the japanese cherry trees are in bloom. 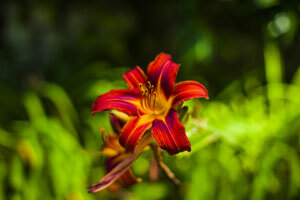 The wonders of the Garden. 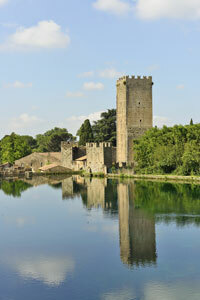 The Garden of Ninfa was declared national monument by the Regione Lazio in 2000. It’s located in the Cisterna di Latina municipality (Latina’s province) and its size is 106 hectars. A walk inside the historical garden allows you to admire several exotic plants, the river, the lake Ninfa and a strip of the reconstructed Pontina swampland (Pantanello). Plants. Among the 1300 plants of the Garden you can admire deciduous magnolias, birches, paludal iris, but also japanese maples, cherry trees and decorative apple trees. The garden also features tropical plants such as avocado, South American gunnera manicata and banana trees whose presence is eased by the mild weather. The WWF oasis. The park features several shrubs that foster several animals, especially birds (more than 100 censused species). Since 1976 the park features a WWF oasis whose goal is to ease the stay and the nesting of the avifauna. Best time of the year. The best time of the year to visit the Garden of Ninfa is between April and May when the blooming reaches its shining apex. Do not miss the japanese cherry tree in bloom. Access with guided tour. You can access the Garden of Ninfa only by taking a guided tour, about an hour long. Access is regulated by time slots. Access is limited to 300 people max, divided into smaller groups. The waiting. We recommend visitors to get there 15 minutes ahead of the tour time. The organization reserves its right to delay the start of the guide by a time between 10 and 50 minutes due to the fact that there’s a tour every 10 minutes. Hortus conclusus. At the end of the tour you’re not allowed to stay in the Garden. You can move on into the hortus conclusus, an italian-style garden from the XVII century that features a citrus grove and a tank popolated by swans. Access for disabled people. The Garden path can be covered with carriages and wheelchairs. Always keep an eye on the bumps though. Booking and purchasing tickets. You can book your tour of the Garden of Ninfa through the online ticketing service. Purchasing the ticket online must be done two days in advance. It allows you to receive the voucher that you need to show when accessing the Garden. Raincheck. Tours are guaranteed even in case of rain. In case of bad weather alert issued by Protezione Civile (Civil Protection) that may endanger the safety of the visitors you can apply for a raincheck. Pets. You can bring your dog but only if the dog weighs under 5 kg and is on leash. The dog owners must also bring poop bags. Bans. Eating meals or having picnics is not allowed in the Garden of Ninfa. Neither is the use of drones. A bit of history. The Garden of Ninfa is managed by Fondazione Roffredo Caetani, that’s also the owner. The history of the hamlet on top of which the natural oasis lays has been quite troubled. It was purchased by the Caetani family in 1298 and the Caetani Family and the Borgia Family fought over it for over 100 years. At the end of 1300, due to an epidemic of malaria, the oasis began to decay. This long dark period lasted until the end of 1800 when the Caetani family reclaimed the swampland creating an english-style garden. In 1930 Marguerite Chapin and her daughter Leila Caetani gave the Garden the shape and the look we know today leaving its management to the Fondazione Caetani, that was founded by them. Wedding pictures. The Garden of Ninfa is open to newly married couples who want to snap some pictures on their wedding day. As in Villa D’Este, a payment of a subsidy is requested in the amount of 100 Euros in the days the Garden is open to the public and 200 Euros when the Garden is closed. Payment must be made by wire transfer in advance. For further information drop and e-mail to info@fondazionecaetani.org, so you can make arrangements on date and times. The Garden of Ninfa opens in springtime and closes in winter. April: 1, 2, 7, 8, 15, 22, 25, 29. May: 1, 5, 6, 13, 20, 27. April, May and June: 9:00 am - 12:00 pm and 2:30 pm - 6:00 pm. July, August and September: 9:00 am - 12:00 pm and 3:00 pm - 6:30 pm. October and November: 9:00 am - 12:00 pm and 2:00 pm - 4:00 pm. Entrance + guided tour: The ticket for the Giardino of Ninfa costs 15 Euros (+ 0,50 Euros, online advance sale) and includes both the entrance and the mandatory guided tour. Children. Entrance and tour are free of charge to kids under 11 accompanied by their parents. The presence of children doesn’t have to be communicated when booking the tour online. However, this exemption does not apply to groups. Disabled people. For disabled people the ticket is 8 Euros, to be paid at the gate directly. To access the hortus conclusus you need to buy the ticket on-site. The ticket is 2 Euros. Roma-Latina train: From Termini station take the regional train to Latina (about 40 minute ride) or intercity train (about 35 minute ride). Once you get to Latina station take the shuttle bus to the Garden of Ninfa. The shuttle bus service is managed by Coop Il sentiero. The bus leaves at 9:30 am, 10:25 am, 11:25 am and 12:50 pm. You can book the shuttle bus only or the tours on the cooperative website. Alternatively take a cab (tel. 0773. 63 22 92, active also on Sundays). Roma-Cisterna di Latina Train: From Termini station you can reach Cisterna di Latina with low cost regional trains (30-40 minutes). In the station service area you can use the shuttle bus service of the Priori company that takes you to Giarden of Ninfa and Sermoneta (9:15 am, 11:20 am; 2:15 pm) at 10 Euros round trip. Return bus leaves at 10:50 am, 12:00 pm and 4:30 pm.